AG Xavier Becerra gave the Dems' Spanish response to the State of the Union. 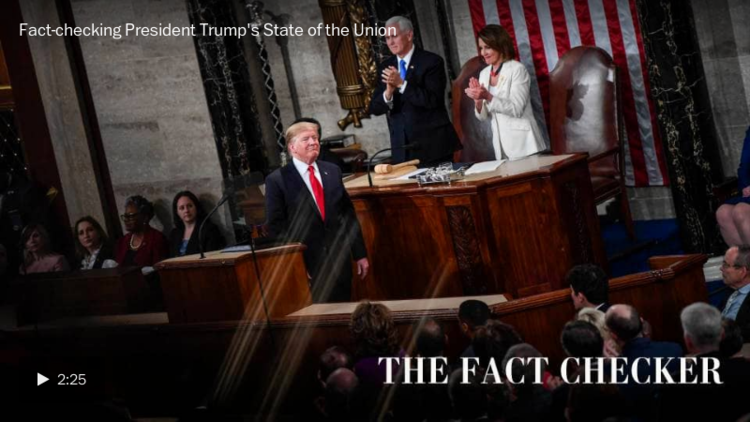 California got its State of the Union licks in on Tuesday, as Attorney General Xavier Becerra delivered the Democrats’ nationally televised Spanish retort to President Donald Trump’s speech. Becerra, son of immigrants from Mexico, spoke from his Sacramento high school alma mater, C.K. McClatchy High School, which also produced California Supreme Court Chief Justice Tani Cantil-Sakauye and former U.S. Supreme Court Justice Anthony Kennedy. What the president presented, of course, is a false choice. The economy boomed in the late 1990s during a period of peace and prosperity as House Republicans investigated, and impeached, Bill Clinton. Trump didn’t seem too worried about the impact of his birther crusade on the nation’s health when Barack Obama was president. 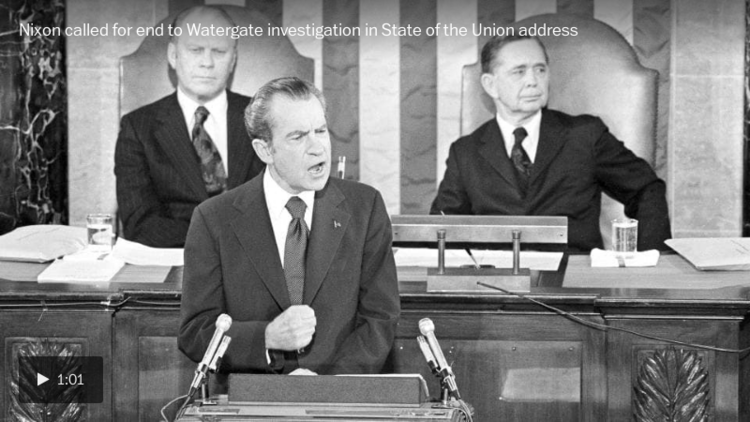 When they had gavels during the Obama years, House Republicans believed they had a constitutional imperative to conduct vigorous oversight of the executive branch. Many headlines this morning, just as in the previous two years, emphasize Trump’s plea for both parties to come together. But the president’s call for an end to the “political stalemate” last night sounded hollow to Democrats just eight weeks after he declared that he would be “proud” to shut down the government to get a border wall. This brinkmanship led to the longest partial government shutdown in American history and continues to create uncertainty as a new funding deadline looms on Feb. 15. -- Looking to 2020, Trump is again singing his greatest hits from 2016. He’s like a band that struggles to play new material because the fans always want to hear the classics. He opened with paeans to unity and harked back to inspiring examples of American greatness, but he got elected promising disruption. The meat of the speech was devoted to the issues that animated his upset victory in the GOP primaries and then over Hillary Clinton. And he kept going back to the set that worked: protectionism, nativism and isolationism. His calls for rebuilding infrastructure and lowering prescription drug prices were also staples of his stump speech as a candidate. Trump did not declare a national emergency to allow for the unilateral, and possibly unlawful, construction of the wall he has promised Mexico would pay for. But he kept the door open to it, as he employed characteristically dark rhetoric to announce that he’s deployed more troops to stop the “onslaught” from a caravan of migrants. 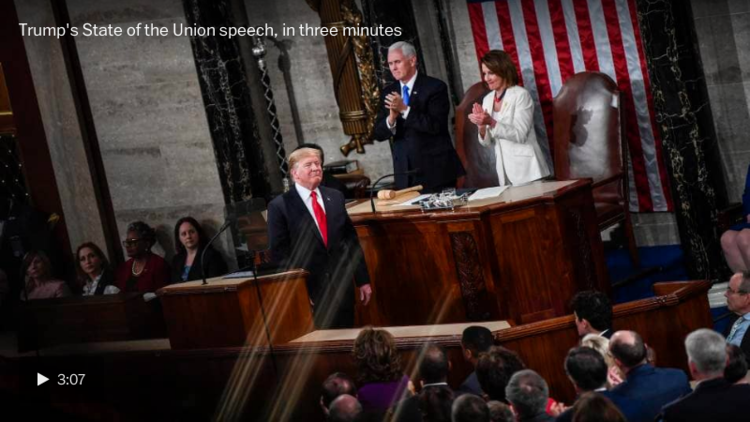 Our graphics team visualized the words Trump used last night that no president has ever before uttered during a State of the Union. Among them: bloodthirsty, sadistic, venomous and chilling. 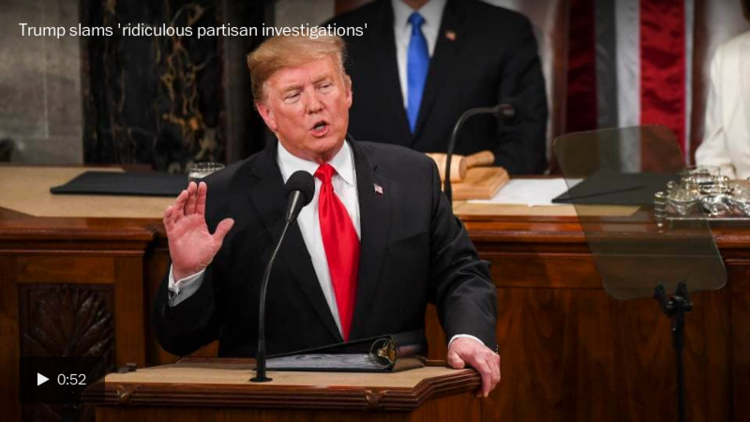 -- “Trump’s comments on illegal immigration elicited groans, leading Pelosi to raise her hand in an attempt to quiet her members. Rep. Ilhan Omar (D-Minn.), a former Somali refugee, listened while holding her head in her hands,” Elise Viebeck and Paul Kane note. 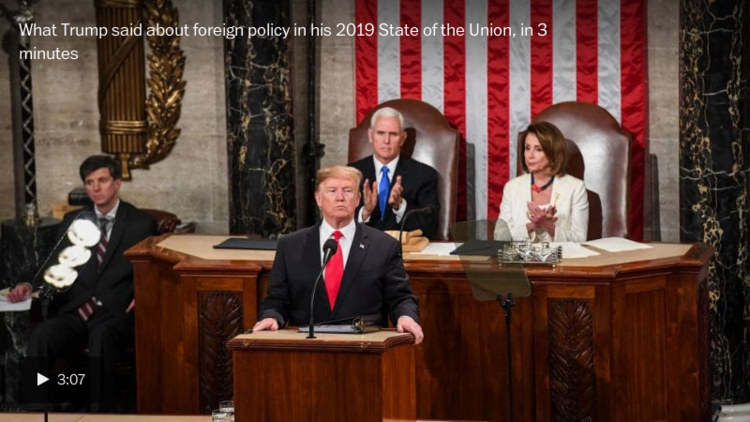 -- Like other presidents who have faced divided government, including Nixon, Trump has devoted more attention to foreign policy as his term has gone on. Obama did the same thing in 2011 after Republicans won the House. There’s less room for big domestic policy gains, so the focus becomes more international. He touted negotiations with the Taliban to seek a peaceful settlement that would allow the United States to withdraw from Afghanistan. Imagine how apoplectic certain conservatives would have been if Obama had spoken to Congress about opening a dialogue with the Taliban. -- Trump also sought to juice his standing with social conservatives by talking in stark terms about abortion. He no longer has a looming Supreme Court vacancy to keep evangelicals in line. Instead, he called for new national restrictions on women’s reproductive rights during the third trimester. 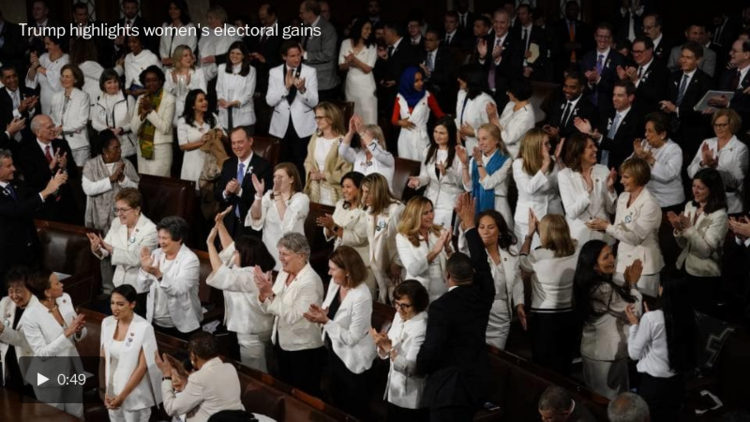 -- The moment that will wind up being remembered most vividly years from now came when Trump engaged with the dozens of Democratic congresswomen who were wearing white. 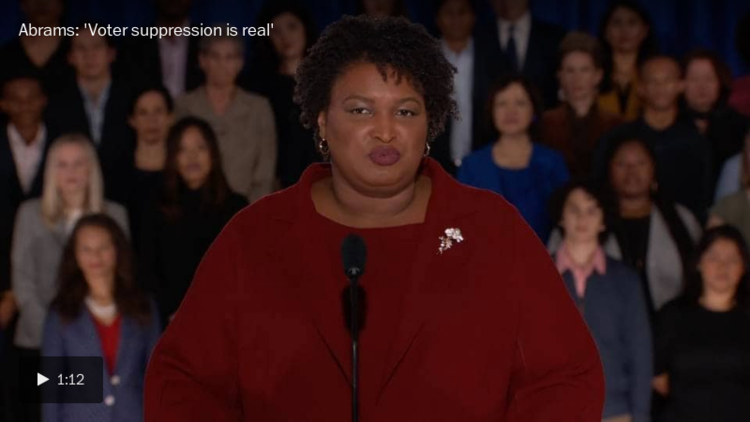 “All Americans can be proud that we have more women in the workforce than ever before,” the president said, “and exactly one century after the Congress passed the constitutional amendment giving women the right to vote, we also have more women serving in the Congress than ever before.” Wearing white, the color of the suffragists, the new female members high-fived one another and started a chant of “U-S-A.” If you were making a documentary about female candidates in 2018, it would be a fitting final scene as the credits role. -- Hey, big spender: Trump didn’t even make a rhetorical nod to the need for fiscal responsibility. The ballooning national debt will be a core element of Trump’s legacy. It’s a story line that, at least for now, continues to be under-covered. But Trump did not mention the deficit or the debt once. When the president previewed the speech for a group of supporters on Monday night, one of his allies asked whether he would discuss the deficit. Acting White House chief of staff Mick Mulvaney interjected. “Nobody cares,” Mulvaney said, per ABC News. Instead, Trump called for major new spending to eradicate HIV and develop new cancer treatments for children. Those are laudable goals, for sure, but he never talked about how he’s going to pay for them. Instead, he boasted about cutting taxes, which has reduced revenue and forced the Treasury to essentially borrow more money from places like China. All of it will need to be paid back – with interest. Trump also indirectly warned that the United States might engage in a costly nuclear buildup after withdrawing from the Intermediate-Range Nuclear Forces Treaty with Russia.“Perhaps we can negotiate a different agreement, adding China and others, or perhaps we can’t — in which case, we will outspend and out-innovate all others by far,” Trump said, not giving a price tag. Unlike previous Republican presidents, Trump neglected to mention entitlement programs such as Social Security and Medicare. Other big issues Trump didn’t touch included climate change, transgender rights, gun control, voting rights, forcible family separations and Puerto Rican hurricane recovery. The president talks a good game about driving into the future, but his eyes are glued to the rear-view mirror. Trump Said He Wants Legal Immigrants To Come 'in the Largest Numbers Ever.' Really? The president was off script, and probably hasn't checked with his ultra-restrictionist White House aide Stephen Miller. Or the $22 trillion (and counting) national debt. Or the entitlement programs that will continue adding to them. But the Michigan libertarian’s reaction wasn't all positive. From OMB head Mick Mulvaney to former Treasury Secretary Larry Summers, nobody cares about spending money we don't have on things we don't need. Big mistake.